Bad habits are hard to break, so Justin Young-the assistant professor of industrial engineering at Kettering University-aims to prevent them. He is researching how gesture controls, voice interactions, augmented reality, multiple device use and other emerging technologies will affect the ergonomics of future office workers. He said that the goal is to come up with something that usable for brain and also for the comfort of body. Video games already use marker-less motion capture technology. Many company has developed this technology to their products such as laptop, game system and else. Young said that the standard keyboard and mouse work well in many context, but can be cumbersome in 3 dimensional virtual space. Decades ago, skyrocketing computer use triggered the rise of carpal tunnel syndrome and repetitive stress injuries. His team hopes to develop best practices to teach workers before they learn to use new techniques like pinch-to-zoom the wrong way. So the research and the consortium that funds it is really interested in looking at these issues before the technology becomes fully mainstream and making sure that what does get out there and what everybody does adopt is ergonomic, easy to use, and does not cause the discomfort and pain issues that many office workers are pretty aware of. Young want so figure out how integrating speech recognition, touchless gesture controls, cellphones, tablets, and augmented reality changes the current paradigm of a keyboard tray, arm rests, keyboard rests, etc. While the newer technologies certainly will have an impact in the office, Young foresees an even bigger impact on many aspect of industrial engineering. 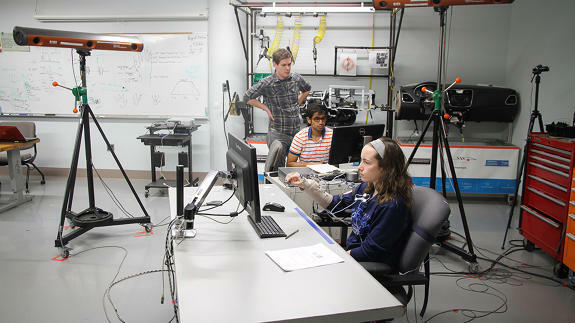 Currently, ergonomists review workplaces in person or via video. The new technologies can add volumes of data. Just like how Microsoft Kinect tracks people walking around a room, improve research grade versions could capture information from assembly lines and other work operations. Young foresees opportunities for time studies that yield quantitative real-time data. Instead of shunting robots off into safety cages, employees could work alongside their industrial partners without being in danger. And engineers could get automatic feedback when workers use unsafe techniques.